Dzhokhar and Tamerlan Tsarnaev: If the suspected Boston Marathon bombers are responsible, the roots of their alienation and anger probably lead back to Chechnya. Why the Tsarnaev brothers have less in common with the 9/11 attackers than the bombers of London and Madrid. 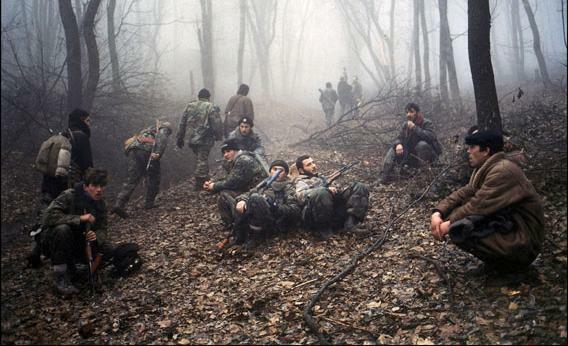 Chechen soldiers take a break after a long night on the road as they attempt to retake Chechnya’s capital, Grozny, circa 1999. There is much that we don’t yet know about Dzhokhar and Tamerlan Tsarnaev, the suspects in the Boston Marathon bombings. But we do know that their family is ethnically Chechen, as in the Russian republic of Chechnya, where war broke out in 1994. Although that war began as a movement for Chechen sovereignty and independence, it escalated into two extraordinarily bloody, messy, vicious armed conflicts, during which hundreds of thousands of people were killed. The Chechen capital, Grozny, was thoroughly destroyed. Photographs taken there after the war’s end look eerily old-fashioned, as though they were from Warsaw or Dresden in 1945. One of the brothers was born in Kyrgyzstan, a former Soviet republic, and it is not odd that they later went to school in Dagestan, another Russian republic. Nor is it strange that the brothers were speaking and posting to their Facebook pages in Russian, which is still the dominant language in much of the post-Soviet world. There are many Russian Muslims and many Chechens living in ethnically Russian Russia, and it wouldn’t be surprising if there are many Chechens living in ethnically Kyrgyz Kyrgyzstan as well. The Soviet Union was a multinational, multiethnic, multireligious state. Much of the post-Soviet world remains equally if sometimes uncomfortably mixed. What seems exotic to Americans, in other words, could prove to be a fairly common story: A Chechen family moves around the former Soviet Union for a few years, finally strikes it lucky, and ends up in the United States. They’ve been here for a decade. The brothers went to high school in Boston. One was a boxing champion, the other a freshman at the University of Massachusetts–Dartmouth. But something went terribly wrong, and perhaps that something had to do with Chechnya. The two bloody Chechen wars caused incredible damage—the 26-year-old older brother, who was killed in a shootout with police early Friday, may well remember the violence—and inspired an equally bloody terrorist movement. Once a largely secular population, some Chechens became radicalized after losing their homes, friends, and families. Highlights of Chechen terrorism include the violent storming of a Moscow theater, attacks by several female suicide bombers, and the bombing of a Moscow airport. Worst of all was the 2004 siege of a primary school in the city of Beslan, a disaster that ended with the deaths of hundreds of parents and children. The nihilism and cruelty of Chechen terrorists—who have often targeted innocent bystanders—seem to have an echo in the horribly random Boston Marathon bombings. One or both of the brothers might well have been in touch with Chechen separatists, whose websites they were reportedly reading. They could even have been in touch with al-Qaida. But I wouldn’t jump to that conclusion. Chechen terrorists have in the past been more anti-Russian than pro-Islam. They were never anti-American. Look, instead, at another possibility—one that is in some ways more disturbing than the convenient “foreigners who hate us” explanation. Although very little has been confirmed, the behavior of the Tsarnaev brothers looks less like that of hardened, trained terrorists and far more closely resembles the second-generation European Muslims who have staged bombings in Madrid, London, and other European cities. Educated and brought up in Europe, these young men nevertheless felt out of place in Europe. Unable to integrate, some turned toward a half-remembered, half-mythological homeland in search of a firmer, fiercer identity. Often they did so with the help of a radical cleric like the one the Tsarnaev brothers may have known. “I do not have a single American friend,” Tamerlan Tsarnaev reportedly said of himself. That’s the kind of statement that might have been made by a young Pakistani living in Coventry or a young Algerian living in Paris. We don’t expect to hear it from someone who grew up in Boston, a city that has taught generations of foreigners to become Americans in a country that likes to think of itself as a melting pot. But now it might be time to change our expectations. These terrorists are a lot less like the 9/11 attackers and a lot more like the men known as the Tube bombers of London or the train bombers of Spain. Our response is going to have to be different—very different—as well.